ABC7 News gathered footage and interviewed our friends and participants for their TV spot about the Girls' Festival and about WorldWideWomen! ABC7 News, Girls' Festival media sponsor, created a wonderful segment for their Bay Area LIFE show. Take a peek and look for yourself if you joined us on October 6th! Comcast's Game On, an all-female sports show, hosted a contest to find the future girl sportscasters of America! GlobalGirl Media asks attendees at the GirlFest 2016 event about their dreams and ambitions, and, "Is It W Good Time To Be Woman?" Business Wire - "WorldWideWomen Champions for Girls"
ABC7 News - "Women, Girls Flock to First Ever WorldWideWomen Fest in San Francisco"
Marin Independent Journal - "Empowering women across globe is Tiburon resident’s goal"
Ronnie's Awesome List - "Q&A With Maureen Broderick, Organizer Of The Girls’ Festival"
The Ark - "WorldWideWomen aims to connect women with resources, support"
Mommynearest - "5 Reasons to Get Tickets for the WorldWideWomen's Girls' Festival"
Marin Magazine - "Better Makers: WorldWideWomen Hosts a Day of Power and Possibility for Bay Area Girls"
SF Gate - "Jam-Packed Girls' Festival Scheduled For Saturday"
Bay Area Reporter - "First Girls' Festival in SF"
Jennifer Siebel Newsom, Co-Founder of The Representation Project, led a panel discussion with inspiring Vital Voices AnnPower Fellows! ABC7 Sports Anchor Mindi Bach talked on a career mentoring panel about her experiences in sports alongside Bianca Valenti, Danielle Slaton, and Joanne Pasternack​. Mark Cuban, Sue Siegel and Tim Draper sat on our panel of judges for the girl entrepreneur competition! 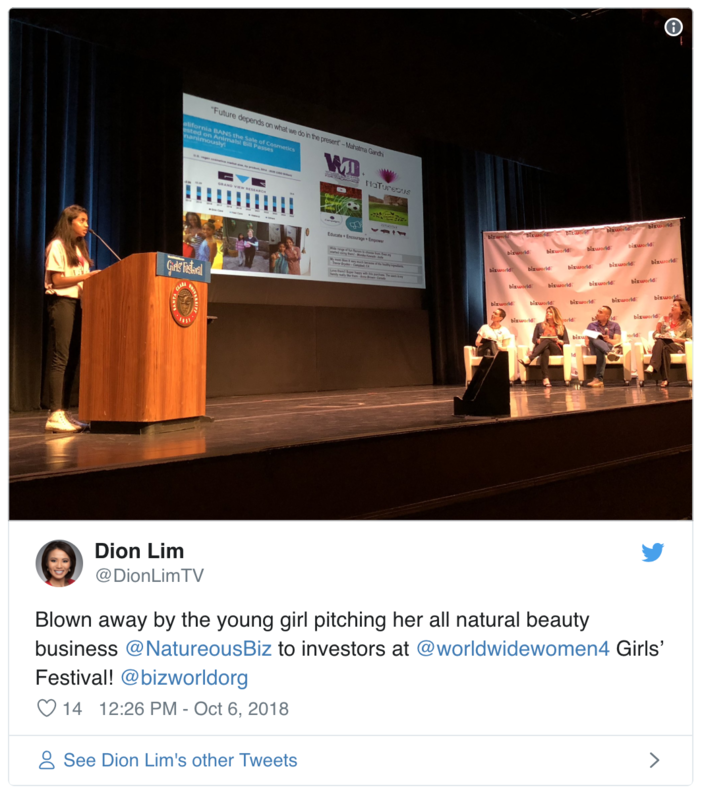 ABC7 News anchor Dion Lim emceed the 2018 Festival and captured part of the BizWorld Girlpreneur Competition!